In the first part of my PhD, patterns of interannual variability of the ocean-atmosphere coupled system in the Southern Hemisphere extratropics are studied with a simple dynamical model in order to determine the basic physical processes of interaction independently of tropical forcing. The model used is an atmospheric quasi-geostrophic model coupled to a ‘‘slab’’ oceanic mixed layer, which includes mean geostrophic advection by the Antarctic Circumpolar Current (ACC). The ocean-atmosphere coupling occurs through surface heat fluxes and Ekman current heat advection. In a fully coupled simulation, the atmospheric part of the model, which includes high-frequency transient eddies at midlatitudes, exhibits a strong Southern Annular Mode (SAM) as the first mode of variability at interannual timescales. The SAM-related wind anomalies induce Ekman currents in the mixed layer which produce sea surface temperature anomalies. These are then advected along by the ACC. A forced mechanism where the ocean role is reduced to advect the sea surface temperature (SST) appears sufficient to reproduce the main features of the variability. Nevertheless, a positive feedback of the ocean was also found. It operates through anomalous Ekman currents heat advection and contributes to the maintenance of the SST anomaly. Low-frequency variability in the Southern Ocean region in a simplified coupled model. G. Maze, F. D’Andrea and A. Colin de Verdière, 2006: J. Geophys. Res., 111, C05010,doi:10.1029/2005JC003181. In the second part of my PhD, the stationary atmospheric response to an idealized sea surface temperature anomaly (SSTa) is studied with a quasi-geostrophic atmospheric model of the Southern Hemisphere. Sensitivity of the stationary response to mid-latitude SSTa location is determined and responses decomposed on vertical modes. Stationary atmospheric responses to an idealized sea surface temperature anomaly in the Southern Ocean. G. Maze, F. D'Andrea, A. Colin de Verdiere and P. Klein. Journal of Climate, in press, 2011. Patterns of interannual variability of the ocean-atmosphere coupled system in the Southern Hemisphere extratropics are studied with a simple dynamical model, in order to determine the basic physical processes of interaction independently of tropical forcing. 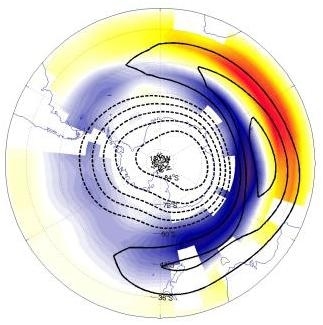 The model used is an atmospheric quasi-geostrophic model coupled to a “slab” oceanic mixed layer, which includes mean geostrophic advection by the Antarctic Circumpolar Current (ACC). The ocean-atmosphere coupling occurs through surface heat fluxes and Ekman current heat advection. In a fully coupled simulation, the atmospheric part of the model, which includes high frequency transient eddies at midlatitudes, exhibits a strong Southern Annular Mode (SAM) as the first mode of variability at interannual time-scales. The SAM-related wind anomalies induce Ekman currents in the mixed layer which produce sea surface temperature anomalies. These are then advected along by the ACC. A forced mechanism where the ocean role is reduced to advect the SST appears sufficient to reproduce the main features of the variability. Nevertheless, a positive feedback of the ocean was also found. It operates through anomalous Ekman currents heat advection and contributes to the maintenance of the SST anomaly. The stationary atmospheric response to an idealised SST anomaly (SSTa) is next studied in the same simple model of the Southern Hemisphere. Sensitivity of the stationary atmospheric response to the SSTa location is determined. Differentiating the barotropic from the baroclinic responses, it was found that for extratropical SSTa, the baroclinic atmospheric response is independent of the SSTa longitude whereas the barotropic response can take two different patterns. The SSTa induces a warm air anomaly through the thermal wind balance, which gives a baroclinic response that creates a trough 45 degrees eastward. This response is simply due to the advection of the SSTa induced anomalous vortex stretching by quasi-stationary westerlies. Baroclinic transients eddies were found to have a dissipative role. The barotropic response consists of midlatitudes ridge and South Pole trough for SSTa localised from the western Atlantic to the Indian center ocean ; and of South Pole ridge for SSTa localised from the Australo-Antarctic basin to the center of the Pacific ocean.The barotropic responses have a similar eddy component. The difference in the response pattern is selected by the zonally symmetric component, which is similar to opposite phases of the Southern Annular Mode (SAM). These SAM-like responses are driven by the anomalous advection of relative vorticity which in turn depends on the position of the SSTa relatively to the geopotential quasi-stationary wave mean field of the model. Les modes de variabilités interannuelles du système couplé océan-atmosphère auxmoyennes latitudes de l’hémisphère sud sont étudiés avec un modèle de compléxité intermédiaire. L’objectif est de déterminer les mécanismes d’interactions océan-atmosphère indépendamment du forçage tropicale. Le modèle est un modèle atmosphérique quasi-géostrophique à 3 niveaux, couplé à une couche de mélange océanique de profondeur constante incluant l’advection géostrophique par le courant circumpolaire Antarctique (ACC). Le couplage océanatmosphère se fait par les flux de chaleur de surface et les transports d’Ekman forcés par la tension de vent de surface. Dans une simulation totalement couplée, l’atmosphère, qui inclue la dynamique des transitoires baroclines, exhibe un mode annulaire (SAM) comme premier mode de variabilité interannuelle. Les anomalies de vent induites par le SAM créent des courants méridiens d’Ekman dans la couche de mélange qui induisent à leur tour des anomalies de température océanique de surface qui sont ensuite avectées par l’ACC. Un mécanisme purement forcé où le rôle de l’océan est réduit à l’advection des anomalies de SST est suffisant pour reproduire les caractéristiques principales de la variabilité. Néanmoins, une rétroaction positive de l’océan est mise en évidence par l’analyse de la réponse stationnaire atmosphérique à une anomalie de SST (SSTa). Celle-ci est déterminée pour un ensemble d’expériences où une SSTa idéalisée est localisée en 14 longitudes différentes, uniformément réparties le long d’un cercle de moyenne latitude. En projetant les réponses obtenues sur les modes verticaux atmosphériques, il est mis en évidence la partition de la réponse en une composante barocline identique quelque soit la position de la SSTa et une composante barotrope se projetant sur le mode dominant de variabilité atmosphérique du modèle. La SSTa induit une anomalie d’air chaud dans la couche basse atmosphérique qui engendre une réponse barocline 45o à l’est. Cette réponse est due à l’advection du vortex stretching induit par la SSTa, par les vents d’ouest quasi-stationnaires. La réponse barotrope consiste en une haute pression aux moyennes latitudes et une basse pression sur le pôle quand les SSTa sont localisées de l’océan Atlantique ouest au centre de l’océan Indien ; et d’une haute pression sur le pôle quand elle est localisée du bassin Autralo- Antarctique au centre de l’océan Pacifique. Les réponses barotropes ont une composante tourbillonnaire identique. La différence entre les réponses est déterminée par la composante zonalement symétrique qui se projette sur le SAM. La réponse barotrope est formée par le terme d’advection de vorticité relative basse fréquence qui est lui-même déterminé par l’impact sur le pôle des interactions de l’anomalie de vorticité relative aux moyennes latitudes avec les ondes stationnaires du modèle. See at the bottom of this page, under Attachments..